You may have up to 6 books total signed in any combination (i.e. 3 with Melissa, 2 with Alyson, 1 with Margaret OR 6 with Alyson, 0 with Melissa, 0 with Margaret). Only books purchased from National Book Store, Bestsellers or Powerbooks will be accommodated. 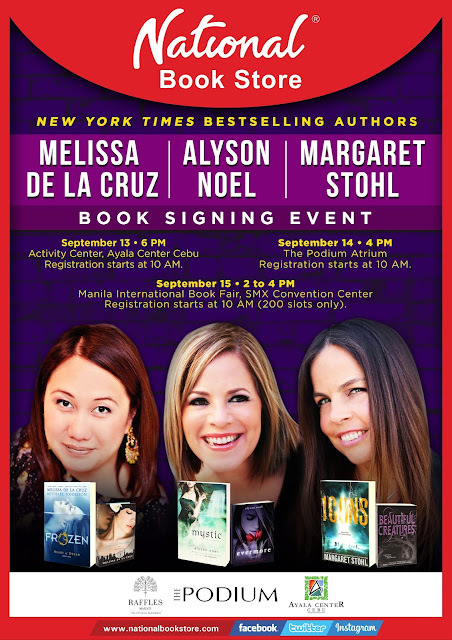 The MIBF signing will be on Sunday, September 15 from 2:00 pm to 4:00 pm in the National Book Store booth. For more information on the MIBF, you can go to www.manilabookfair.com.